Journal of the House of Lords: Volume 18, 1705-1709. Originally published by His Majesty's Stationery Office, London, 1767-1830. E. of Holderness takes the Oaths. Carey's Claim to the Barony of Humdon, Report from the Committee of Privileges about. Message to H. C. with its. Messages from thence, with a Bill, and to return the E. of Exeter's. Repeal of Act for garbling of Spices, Bill. Security of the Queen's Person and Government, Bill. Habeas Corpus Act, for suspending, Bill; read Three Times and passed without Commitment. 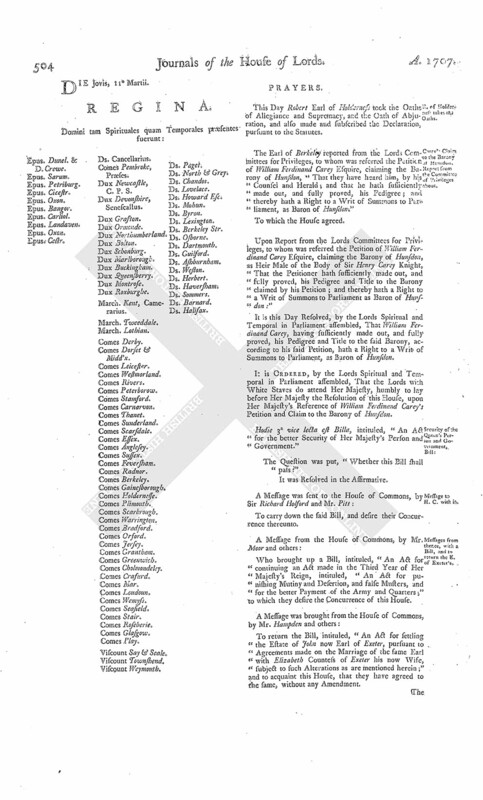 Militia of Scotland Bill, refused the Royal Assent. Committee to draw an Address. Epus. Dunel. & D. Crewe. Dux Newcastle, C. P. S.
This Day Robert Earl of Holderness took the Oaths of Allegiance and Supremacy, and the Oath of Abjuration, and also made and subscribed the Declaration, pursuant to the Statutes. The Earl of Berkeley reported from the Lords Committees for Privileges, to whom was referred the Petition of William Ferdinand Carey Esquire, claiming the Barony of Hunsdon, "That they have heard him, by his Counsel and Herald; and that he hath sufficiently made out, and fully proved, his Pedigree; and thereby hath a Right to a Writ of Summons to Parliament, as Baron of Hunsdon." Upon Report from the Lords Committees for Privileges, to whom was referred the Petition of William Ferdinand Carey Esquire, claiming the Barony of Hunsdon, as Heir Male of the Body of Sir Henry Carey Knight, "That the Petitioner hath sufficiently made out, and fully proved, his Pedigree and Title to the Barony claimed by his Petition; and thereby hath a Right to a Writ of Summons to Parliament as Baron of Hunsdon:"
It is this Day Resolved, by the Lords Spiritual and Temporal in Parliament assembled, That William Ferdinand Carey, having sufficiently made out, and fully proved, his Pedigree and Title to the said Barony, according to his said Petition, hath a Right to a Writ of Summons to Parliament, as Baron of Hunsdon. It is Ordered, by the Lords Spiritual and Temporal in Parliament assembled, That the Lords with White Staves do attend Her Majesty, humbly to lay before Her Majesty the Resolution of this House, upon Her Majesty's Reference of William Ferdinand Carey's Petition and Claim to the Barony of Hunsdon. Hodie 3a vice lecta est Billa, intituled, "An Act for the better Security of Her Majesty's Person and Government." 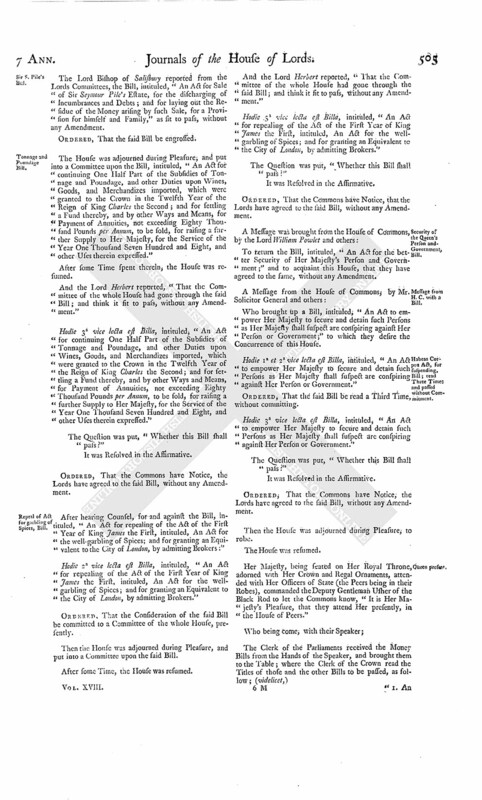 Who brought up a Bill, intituled, "An Act for continuing an Act made in the Third Year of Her Majesty's Reign, intituled, "An Act for punishing Mutiny and Desertion, and false Musters, and for the better Payment of the Army and Quarters;" to which they desire the Concurrence of this House. To return the Bill, intituled, "An Act for settling the Estate of John now Earl of Exeter, pursuant to Agreements made on the Marriage of the same Earl with Elizabeth Countess of Exeter his now Wife, subject to such Alterations as are mentioned herein;" and to acquaint this House, that they have agreed to the same, without any Amendment. The Lord Bishop of Salisbury reported from the Lords Committees, the Bill, intituled, "An Act for Sale of Sir Seymour Pile's Estate, for the discharging of Incumbrances and Debts; and for laying out the Residue of the Money arising by such Sale, for a Provision for himself and Family," as fit to pass, without any Amendment. The House was adjourned during Pleasure; and put into a Committee upon the Bill, intituled, "An Act for continuing One Half Part of the Subsidies of Tonnage and Poundage, and other Duties upon Wines, Goods, and Merchandizes imported, which were granted to the Crown in the Twelfth Year of the Reign of King Charles the Second; and for settling a Fund thereby, and by other Ways and Means, for Payment of Annuities, not exceeding Eighty Thousand Pounds per Annum, to be sold, for raising a further Supply to Her Majesty, for the Service of the Year One Thousand Seven Hundred and Eight, and other Uses therein expressed." After some Time spent therein, the House was resumed. And the Lord Herbert reported, "That the Committee of the whole House had gone through the said Bill; and think it fit to pass, without any Amendment." Hodie 3a vice lecta est Billa, intituled, "An Act for continuing One Half Part of the Subsidies of Tonnage and Poundage, and other Duties upon Wines, Goods, and Merchandizes imported, which were granted to the Crown in the Twelfth Year of the Reign of King Charles the Second; and for settling a Fund thereby, and by other Ways and Means, for Payment of Annuities, not exceeding Eighty Thousand Pounds per Annum, to be sold, for raising a further Supply to Her Majesty, for the Service of the Year One Thousand Seven Hundred and Eight, and other Uses therein expressed." Ordered, That the Commons have Notice, the Lords have agreed to the said Bill, without any Amendment. After hearing Counsel, for and against the Bill, intituled, "An Act for repealing of the Act of the First Year of King James the First, intituled, An Act for the well-garbling of Spices; and for granting an Equivalent to the City of London, by admitting Brokers:"
Hodie 2a vice lecta est Billa, intituled, "An Act for repealing of the Act of the First Year of King James the First, intituled, An Act for the wellgarbling of Spices; and for granting an Equivalent to the City of London, by admitting Brokers." Ordered, That the Consideration of the said Bill be committed to a Committee of the whole House, presently. Hodie 3a vice lecta est Billa, intituled, "An Act for repealing of the Act of the First Year of King James the First, intituled, An Act for the wellgarbling of Spices; and for granting an Equivalent to the City of London, by admitting Brokers." To return the Bill, intituled, "An Act for the better Security of Her Majesty's Person and Government;" and to acquaint this House, that they have agreed to the same, without any Amendment. Who brought up a Bill, intituled, "An Act to empower Her Majesty to secure and detain such Persons as Her Majesty shall suspect are conspiring against Her Person or Government;" to which they desire the Concurrence of this House. Hodie 1a et 2a vice lecta est Billa, intituled, "An Act to empower Her Majesty to secure and detain such Persons as Her Majesty shall suspect are conspiring against Her Person or Government." Ordered, That the said Bill be read a Third Time, without committing. Hodie 3a vice lecta est Billa, intituled, "An Act to empower Her Majesty to secure and detain such Persons as Her Majesty shall suspect are conspiring against Her Person or Government." Then the House was adjourned during Pleasure; to robe. Her Majesty, being seated on Her Royal Throne, adorned with Her Crown and Regal Ornaments, attended with Her Officers of State (the Peers being in their Robes), commanded the Deputy Gentleman Usher of the Black Rod to let the Commons know, "It is Her Majesty's Pleasure, that they attend Her presently, in the House of Peers." "1. An Act for continuing One Half Part of the Subsidies of Tonnage and Poundage, and other Duties upon Wines, Goods, and Merchandizes imported, which were granted to the Crown in the Twelfth Year of the Reign of King Charles the Second; and for settling a Fund thereby, and by other Ways and Means for Payment of Annuities, not exceeding Eighty Thousand Pounds per Annum, to be sold, for raising a further Supply to Her Majesty, for the Service of the Year One Thousand Seven Hundred and Eight, and other Uses therein expressed." "2. 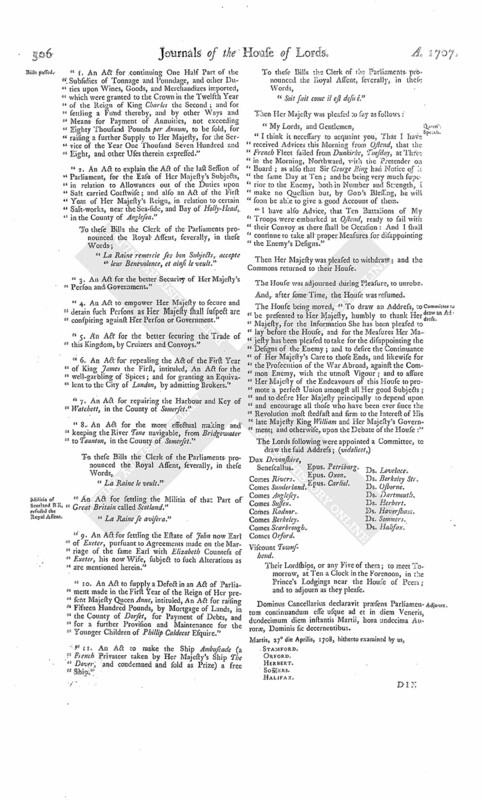 An Act to explain the Act of the last Session of Parliament, for the Ease of Her Majesty's Subjects, in relation to Allowances out of the Duties upon Salt carried Coastwise; and also an Act of the First Year of Her Majesty's Reign, in relation to certain Salt-works, near the Sea-side, and Bay of Holly-Head, in the County of Anglesea." "La Raine remercie ses bon Subjects, acceptc leur Benevolence, et ainsi le veult." "3. An Act for the better Security of Her Majesty's Person and Government." "4. An Act to empower Her Majesty to secure and detain such Persons as Her Majesty shall suspect are conspiring against Her Person or Government." "5. An Act for the better securing the Trade of this Kingdom, by Cruizers and Convoys." "6. An Act for repealing the Act of the First Year of King James the First, intituled, An Act for the well-garbling of Spices; and for granting an Equivalent to the City of London, by admitting Brokers." "7. An Act for repairing the Harbour and Key of Watchett, in the County of Somerset." "8. An Act for the more effectual making and keeping the River Tone navigable, from Bridgewater to Taunton, in the County of Somerset." "An Act for settling the Militia of that Part of Great Britain called Scotland." "9. An Act for settling the Estate of John now Earl of Exeter, pursuant to Agreements made on the Marriage of the same Earl with Elizabeth Countess of Exeter, his now Wife, subject to such Alterations as are mentioned herein." "10. An Act to supply a Defect in an Act of Parliament made in the First Year of the Reign of Her present Majesty Queen Anne, intituled, An Act for raising Fifteen Hundred Pounds, by Mortgage of Lands, in the County of Dorset, for Payment of Debts, and for a further Provision and Maintenance for the Younger Children of Phillip Caldecot Esquire." "11. An Act to make the Ship Ambuscade (a French Privateer taken by Her Majesty's Ship The Dover, and condemned and sold as Prize) a free Ship." "Soit sait come il est desire." "I think it necessary to acquaint you, That I have received Advices this Morning from Ostend, that the French Fleet sailed from Dunkirke, Tuesday, at Three in the Morning, Northward, with the Pretender on Board; as also that Sir George Bing had Notice of it the same Day at Ten; and he being very much superior to the Enemy, both in Number and Strength, I make no Question but, by God's Blessing, he will soon be able to give a good Account of them. "I have also Advice, that Ten Battalions of My Troops were embarked at Ostend, ready to sail with their Convoy as there shall be Occasion: And I shall continue to take all proper Measures for disappointing the Enemy's Designs." Then Her Majesty was pleased to withdraw; and the Commons returned to their House. And, after some Time, the House was resumed. The House being moved, "To draw an Address, to be presented to Her Majesty, humbly to thank Her Majesty, for the Information She has been pleased to lay before the House, and for the Measures Her Majesty has been pleased to take for the disappointing the Designs of the Enemy; and to desire the Continuance of Her Majesty's Care to those Ends, and likewise for the Prosecution of the War Abroad, against the Common Enemy, with the utmost Vigour; and to assure Her Majesty of the Endeavours of this House to promote a perfect Union amongst all Her good Subjects; and to desire Her Majesty principally to depend upon and encourage all those who have been ever since the Revolution most stedfast and firm to the Interest of His late Majesty King William and Her Majesty's Government; and otherwise, upon the Debate of the House:"
Their Lordships, or any Five of them; to meet Tomorrow, at Ten a Clock in the Forenoon, in the Prince's Lodgings near the House of Peers; and to adjourn as they please. Dominus Cancellarius declaravit præsens Parliamentum continuandum esse usque ad et in diem Veneris, duodecimum diem instantis Martii, hora undecima Auroræ, Dominis sic decernentibus.